Category Archives for "arm Injuries"
Why is There Numbness and Tingling in my Arms? There are many possible causes of numbness and tingling in the upper or lower limbs. Some of these causes may include: nerve injury, prolonged sedentary position, pressure on the nerves due to a herniated disk, enlarged vessels, or tumors, shingles, abnormal levels of salts and minerals in the body, or congenital conditions. Other medical conditions such as carpal tunnel syndrome, diabetes, or strokes may lead to numbness and tingling. Local pressure on a nerve may cause distinct patterns of numbness that may also be associated with weakness or spasms. Compression of the ulnar nerve at the wrist may cause numbness and tingling of the little and ring fingers. Compression of the same nerve at the elbow may present numbness on the back of the ulnar side of the hand. Likewise, compression of the radial nerve just above the wrist may cause numbness on the back side of the thumb and index finger. 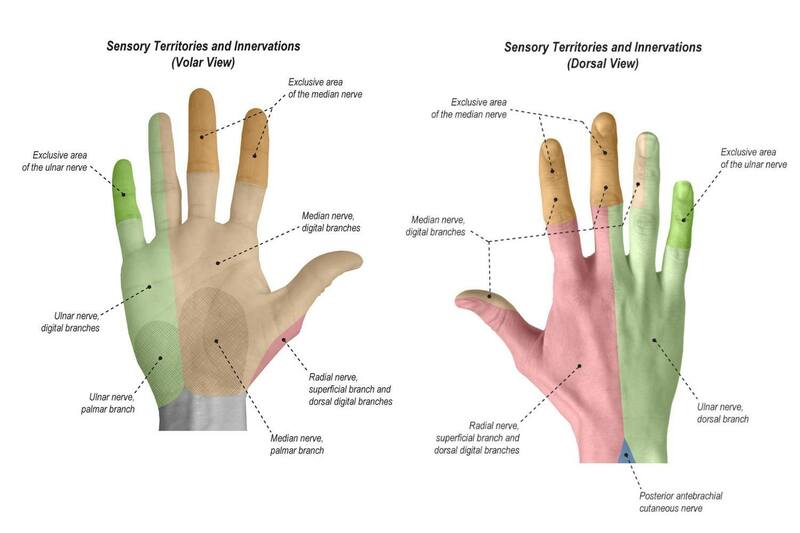 Compression of the median nerve just below the elbow joint may present numbness on the palmar side from the middle finger to the thumb. If the cause of the symptoms has been determined, ensure to follow the necessary steps as prescribed by your doctor to reduce or eliminate the condition. Certain exercises may be recommended to alleviate pressure on the peripheral nerves causing the numbness and tingling. Control blood sugar or vitamin levels with the appropriate daily dosage. Do not take large doses of any vitamins or supplements until discussion has been made with a medical professional. Large amounts of vitamins or supplements may result in nerve toxicity which can cause numbness and tingling. Further testing may include X-rays, MRI, nerve or blood tests to help diagnose or treat the appropriate condition. Begin in a seated position with tall posture and shoulders down. Then create a circle with your thumb and index finger and bring the elbow and forearm up while pointing the heel of the hand upwards forming a mask over your eye with the circle. Hold this for a second and then return the arm and hand back to the starting position. Repeat this for sixty seconds, doing five sets three times per day. The progression of this exercise is to first start with the head rotated away, then bringing the thumb and index finger over the eye. The duration is also for 60 seconds for 5 sets, three times per day. Begin by extending the shoulder and arm with the elbow straight behind you while flexing the wrist and the hand out to receive a “low - five” from behind you. Return the arm and hand back to neutral position by the side and repeat this for up to thirty seconds when you initially start to get the hang of it and then increasing it to sixty seconds. Do five repetitions each time three times per day. The progression of this exercise involves the rotation of the head and neck to the opposite side first and then reaching back with the arm and hand for the “low-five” and then return the head and arm and hand back to the neutral start position. Do this for 60 seconds for 5 repetitions three times per day. Begin by placing your left hand on your right shoulder & look away to the opposite side. Abduct the shoulder to 90 degrees and together extend the elbow, wrist and fingers fully. Then turn your head to the right side and release the whole right upper extremity by flexing the fingers, wrist and elbow together. Repeat this again by looking to the opposite side and extending the entire right upper extremity again. Do this for 60 seconds for 3 sets 3 times per day. 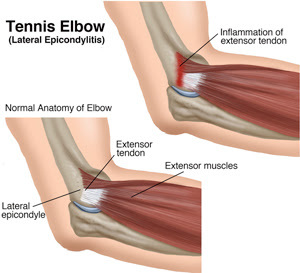 Tennis elbow is a painful condition caused by overuse of the “extensor” muscles in your arm and forearm, particularly where the tendons attach to rounded projections of bone (epicondyles) on the outside or lateral aspect of the elbow. The muscles you use to grip, twist, and carry objects with your hand all attach to the “lateral epicondyle” at the elbow. That’s why a movement of the wrist or hand can actually cause pain in the elbow. Your physical therapist can design a specific treatment program to speed your recovery. There will very likely be exercises and other treatments that you will be expected to do at home. Your physical therapist also might use special physical therapy treatments to help relieve pain, such as manual therapy, special exercises, ice or heat treatments or both, and electrical stimulation. For an “acute” case of tennis elbow—one that has occurred within the past few weeks— it’s important to treat as early as possible. Left untreated, tennis elbow may become chronic and last for months and sometimes even years. This is especially true if treatment is focused only on relieving pain and not on correcting the muscle weakness and bad habits that might have led to your condition in the first place. Insufficient muscle strength can lead to tennis elbow. Sometimes the weakness is in the muscles of the wrist and forearm. In many cases, the problem stems from weakness of the supporting postural, or “core,” muscles. In fact, you might find that it is necessary to improve your overall level of fitness to help manage your elbow condition. Based on the evaluation, your physical therapist can determine the type and amount of exercises that are right for you. Your physical therapist will help you remain active by teaching you how to modify your daily activities to avoid pain and further injury. Sometimes it’s necessary to make changes at work, on the playing field, or in the home. Your physical therapist can help you make simple modifications to your work site, your computer set-up, your kitchen devices, your sports equipment, and even your gardening tools to lessen the strain to your hand, wrist, and forearm. Your therapist will emphasize the importance of taking stretch breaks so that your muscles get frequent rest from repetitive movements and standing or sitting in the same position. Tennis may be a contributing factor to tennis elbow for several reasons. Sometimes the problem results from over-training. In other cases, the weight of the racquet or its grip may need to be adjusted. For others, the problem may stem from improper form, poor overall fitness, or a lack of strength in the supporting or “core” muscles of the trunk and shoulder blades. A physical therapist can help analyze the source of the problem and help find a solution.